to Solve a Mystery. As spring sweeps across the Northern Hemisphere, day length changes everywhere on Earth. Mystery Class is a global game of hide-and-seek. Students follow sunlight clues to find ten secret sites located around the world. 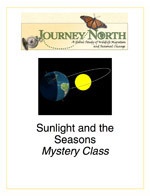 As students solve the mystery, they discover the reasons for seasons. Play this Magnet Mission Impossible game, where you are the agent who must use the magnets to stop the thief from stealing the priceless treasure. Photos used under Creative Commons from essygie, oskay, sila, greg westfall.